Malaria is a wide-spread health concern in sub-Saharan Africa, especially for pregnant women. Researchers recently published a review in the Malaria Journal reviewing the effects of malarial infection on fetal outcome. Based on information collected between 2006 and 2009 via 1,218 pregnant women – narrowed down to 1,069 women by the end of the study, 27% of women contracted malaria. Malarial infection rates were higher in women with HIV, lower educational levels and women living in rural communities. While malaria infection in pregnancy did not affect fetal length, birth weight was lower in offspring born to infected mothers. Infected women were also at increased risk of early delivery and miscarriage. 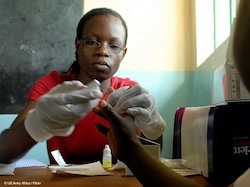 Researchers believe women, especially those in rural areas, should be regularly screened for malaria. With proper treatment, risk of negative fetal outcome, miscarriage and early delivery could be significantly reduced. Source: De Beaudrap P, Turyakira E, White LJ, Nabasumba C, Tumwebaze B, Muehlenbachs A, Guérin PJ, Boum Y 2nd, McGready R, Piola P. Impact of malaria during pregnancy on pregnancy outcomes in a Ugandan prospective cohort with intensive malaria screening and prompt treatment. Malar J. 2013 Apr 24;12(1):139.